Every year the annual BAFTA's serve up some serious hair and beauty looks that leave us green with envy and this years ceremony was no exception. From the Duchess of Cambridge’s elegant up do to Timothy Chamelet’s textured locks, our industries insiders have laid out how to recreate their red carpet styles in no time at all. “ Kate Middleton looked classy and stunning as ever at the 2019 BAFTA's. Her simple yet chic up do is one of my favourite looks on her and you can create it at home too. Start by brushing your hair back towards the back of your head and secure into a ponytail. Begin to section pieces of hair and pin them to create this interesting, soft shape. Once you are happy with this, use your fingers to tease some strands of hair loose and finish with JOICO Power Spray to keep it in place and add a subtle sheen”. “Amy Adam’s hairstyle from this years BAFTA Awards was definitely one of my favourites. Low key and understated, her pretty and polished ponytail looked great teamed with a hair bow that’s been all over the catwalks recently. When creating the perfect ponytail, prepping the hair is so important. Dry shampoos and texture sprays in particular are great for giving the hair some grip prior to styling into a ponytail. Once you have finished your ponytail spray it with some hairspray to lock it into place, however, be sure not to overload it with too much hairspray to avoid it looking too set. For a more slicked-back and polished look like Amy’s, once you have put your ponytail into place, use a gel, serum or shine spray on the hair to tame any flyaway hair and give it a sleeker look”. Millie's colour is dreamy and she looked stunning on the carpet! Celestial threads of colour placed around the halo section creates show-stopping blondes, this ring of light keeps your colour dimensional, high impact and ethereal also gives added volume & lift. I think Millie has definitely used this technique to achieve her super soft colour. With the placement of this colour and the way it blends from the root naturally it grows out seamlessly, it also looks as good in an updo as it does down! I do recommend a gloss every 6 weeks to keep the tone fresh and the colour vibrant and glossy just like Millie. 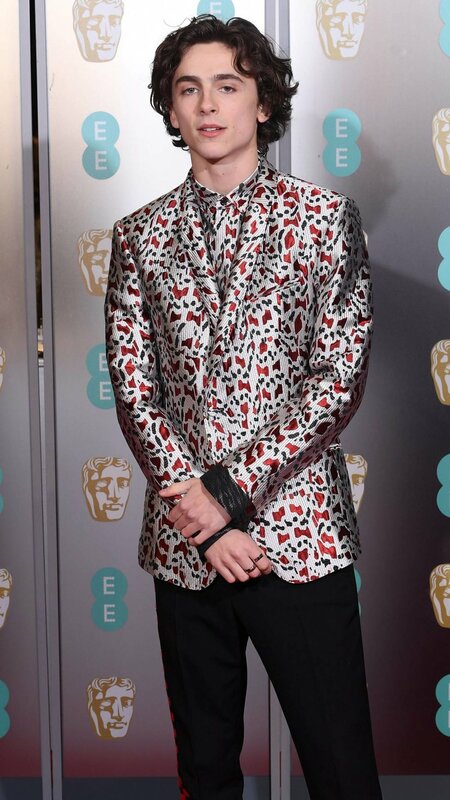 Timothee Chalamet was definitely one of the best-dressed men at this years 2019 BAFTA Awards and his cool and quirky clothing choice looked great teamed with his long, textured locks. Men’s hairstyles are constantly evolving and for 2019 it’s all about these longer in length, grown out hairstyles that are around shoulder length or longer and that are full of texture and require little to no styling. With these hairstyles men can experiment with salt sprays and textuirising sprays to give their hair an effortless and undone, messy look, just like Timothee’s. Skin is the focus for red carpet makeup and achieving that dewy skin is key. The Crystal Clear Ready, Set, Glow kit is perfect to get your skin prepped at home. Follow with your chose foundation and blend this into skin with a damp sponge before applying concealer under your eye in a triangle shape to achieve the bright, flawless finish. Add bronzer using a large fluffy brush to avoid harsh lines and finish with a fluffy, brushed up brow and subtle eye makeup to rock the red carpet like Irina. Lily’s dark blue outfit is so strong that you cannot compete with it on a make up level! To do too much would be too harsh and to do too little would mean that the outfit would swallow her up! Her look is dramatic but soft and is perfect with her outfit choice. Lily also has amazing brows. They are strong and naturally shaped and to keep these looking soft and controlled she has shaped with a brow gel and filled in where needed only. Her lips are also perfectly applied with a dark burgundy red! Due to her strong lip colour, the rest of her face has to be softened. Therefore, she has applied soft blusher and shimmer to her cheeks and eyes to do this. Her lashes are long and spidery enhancing a softer look but keeping the eyes wide open. The look is perfect!